I haven’t seen many churches running advertisements on their sites, but I have seen plenty of churches scratching their head for a way to raise funds. And being an Internet kind of guy, my natural tendency is to ask the question, “What about ads?” So we turned the question to you: Are ads on a church site a cheap sellout or a great way to add to tithes? Well, 62% of you think it’s a ridiculous idea. You think it communicates that the church is a bunch of sellouts, and you would rather them find other ways to raise their funds. And the other 38% of you think it just shows that they’re willing to think outside of the box for revenue streams. 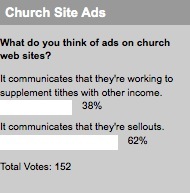 Perhaps a better question would be just how much it would turn you off to find ads on a church web site. Historically low actual percentages of people who tithe combined with an economic downturn will have churches turning in new directions for income. But only time will tell if they turn to ads or elsewhere. This week, we want to know: How often does your church consider a comprehensive re-branding? Our Vicar uses an affiliate relationship with Amazon for books that he recommends or mentions on his blog. He makes no bones about the fact that the church gets a percentage of the purchase price. I think that the combination of convenience of purchasing with one click while reading his review of the book, combined with the revenue for the church, pretty much raises this scheme above question. At least I have heard absolutely no negative comments about it so far. In our part of the world, the Roman Catholic churches all run a lot of ads on the back page of their church bulletins; so I’m really not sure I see any difference between doing that and doing the same thing on a website. Evangelicals tend to be more tentative about this sort of thing; which is why you can go to a church for a decade and never know what the people you’re worshiping with actually DO the rest of the week.